As well as going to the V&A last week, I have been working hard on developing the first large piece from my 37 steps series. I'm aiming for it to be 37in wide by 74 high. I've deliberately made it bigger, so I can cut it down to size afterwards. Yesterday and today I've machine quilted solidly and there is still loads to do, but here are some in-progress photos, to prove I'm still working! 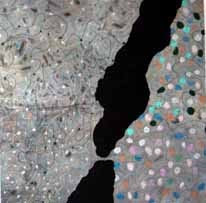 The background was a marbled fabric, which I painted grey. Some of the patches added are grey and the background stitching is grey. When I was at college and we started dyeing fabric, one of the other students looked at the grey dye tin and wondered who on earth would want to use that. I did! It looked great to me as I was trying to make something based on the idea of the city. I recently purchased a large bottle of grey fabric paint, elegantly called 'pewter' rather than grey (dye-na-flow made by Jacquard) and I've already used lots of it, just on this piece. My aunt bought me some reels of Gutermann thread when her local post office closed and I've used virtually all of the 1,000m of grey. Luckily I've found some more greys in my stash, several of which were passed on by my cousin, but I've going to have to get some more soon, especially if I carry on with more in the series. This is laying out the patches to be appliqued on. One of the highlights of the quilts exhibition at the V&A, for both the curators and me was the George III coverlet, but for different reasons. 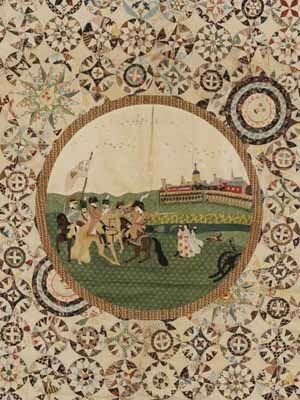 The coverlet, of which I only have details of the centre, is surrounded by forty appliquéd scenes of life from the early 19th century. These have been carefully researched and excited the historians and curators as they have traced the sources of the scenes back to prints available at the time and many of them show then current events. These historical scenes are interspersed with images of domestic life, giving an insight into the maker’s home life. They are very detailed. However interesting these are, what excited us as quilters were the circular patterns covering the centre of the coverlet, which is why I have no images of the borders! There would have been 324 of them, but some have been covered by the medallion of ‘George III reviewing the troops’. This appliquéd medallion raised a lot of questions. Why would anyone spend all that time piecing all the circles to then cut away to put the medallion in? Also, it is referred to as the ‘central’ medallion, but it isn’t in the centre – it is nearer the top than the bottom. I suppose this could be as the coverlet was intended for use on the bed, so it would be on the centre of the bed. However, I’m not sure what the purpose of the coverlet was. Is it for a bed? Another question that wasn’t really discussed in the catalogue, is not only has the ‘central’ medallion been appliquéd over the circles, there are two sun circles, bigger than the other circles over them, in no discernable pattern and the central medallion cuts through one of them. How could a maker of such skill do this? What was the intention? Did it change? 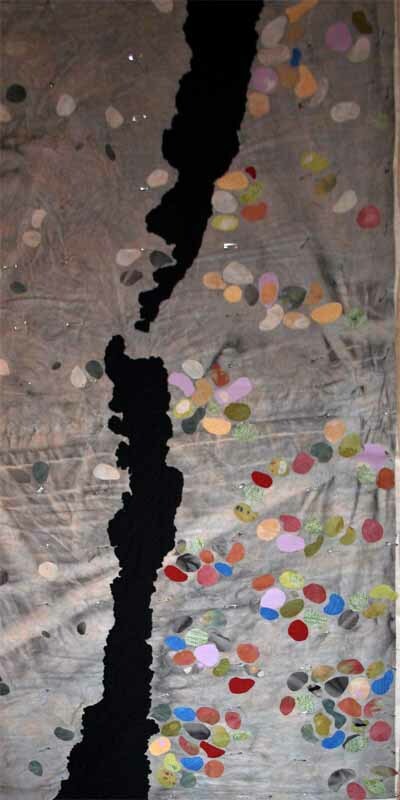 The remaining circles from the 324 which haven’t been appliquéd over (and I assume the circles underneath have been cut away to keep the fabric the same weight over the whole coverlet, so the evidence of them has disappeared), are an amazing variety of patterns and designs in circles. 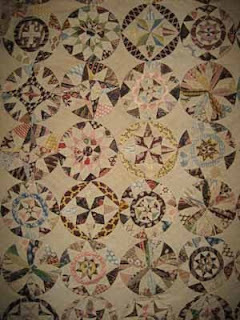 Katy, the web editor of Popular Patchwork, suggested that the circles would make a fantastic quilt in the style of the famous ‘Dear Jane’ one, copying all these patterns faithfully. I’m sure I’m not the person to do this, but the patterns are inspiring. I’ve already started doodling circles and then trying to divide them in interesting ways. 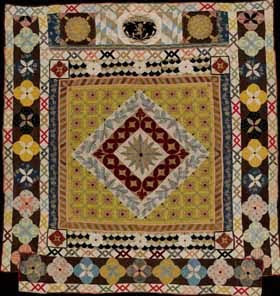 Normally I don’t get as excited by historical work as contemporary, but this quilt is fascinating, as are all the questions it raises for quilters. Have a look at the circles and see what you think of them. Wow. 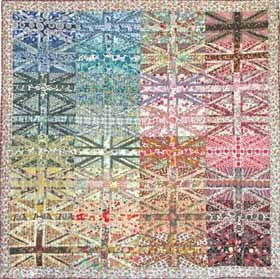 I’ve just spent a few days in London, child-free, primarily to visit the V&A Quilt exhibition. It was well worth the effort involved in arranging childcare (six plus sets of people helped out – thank you!). I nearly said I had been to the V&A’s quilt show, but that doesn’t quite fit the description. 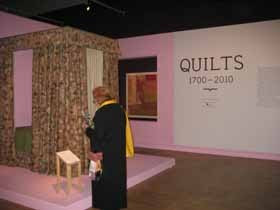 This was a proper exhibition, with exhibition designers making the quilts look as good as possible. 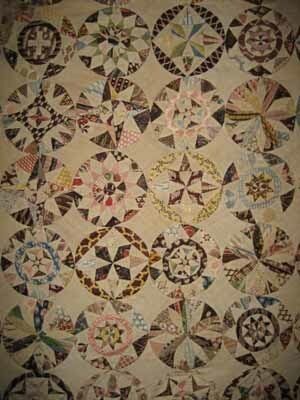 There were no quilts at angles so they could all be fitted in, on temporary wooden bars. 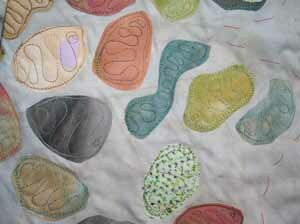 And the quilts benefited from it. One clever feature was the use of ‘windows’ in some of the walls so you got the juxtaposition of one quilt with another. This worked best at the entrance, where you could see Jo Budd’s specially commissioned work peeping through, contrasting with the set of bed hangings from the 18th century. 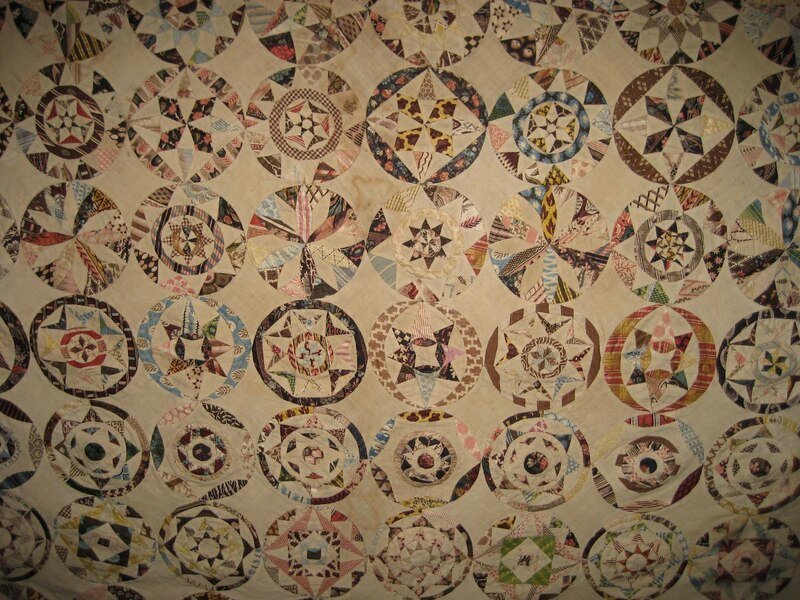 One famous quilt, known as the Elisabeth Chapman coverlet, had a space cut in the wall behind it so you could see the papers still tacked in place on the back. These papers, originally thought to be love letters are apparently more mundane: pieces cut from children’s jotters, newspapers, accounts books and receipts. 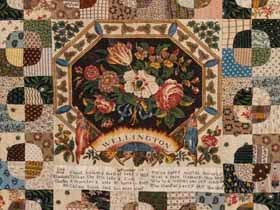 The quilt cannot have been finished as the papers had not been removed, but this is what makes it valuable to historians: little snatches of every day early 19th century lives. 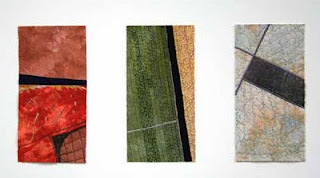 Generally I prefer contemporary work to historical quilts, but the history here has been carefully researched and presented with the quilts, adding to the viewing. 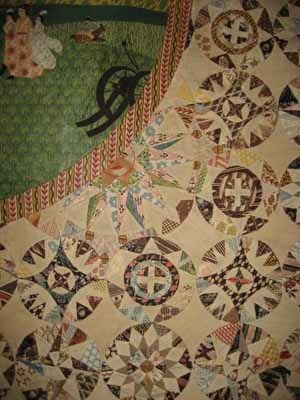 The workmanship of the older quilts was also outstanding, but that may be why these pieces have survived and other lesser ones have not. 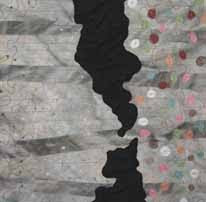 It would be unfair to compare the workmanship of the older quilts to the modern ones as we live in different times and although Jo Budd may not use as many pieces or as many stitches to the inch as an 18th century quilter, I suspect there is just as much work that went into her large artworks. 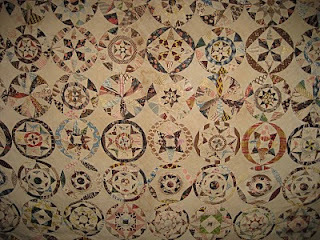 Viewing the exhibition with others from the Popular Patchwork team and other members of the press also made the experience more interesting as we all picked up on different highlights and spotted different qualities in the quilts, such as the Joanna Southcott coverlet including embroidery in hair. I have loads more to say, which I’m going to spread over a number of posts to keep things relatively short. But in the meantime, I strongly urge you to get a ticket to the exhibition if you can. If a visit is not possible, here are some images from the exhibition in consolation of a bed quilt from 1690-1750 and Janey Forgan's Liberty Jack, winner at the Festival of Quilts in 2008. Just in case you thought I was spending too much time on 'serious' work, here are some pictures to show it isn't always the case (oh, the shame!). Last week, I had a few friends round one evening to show them how to make felt. We had a great time and the results were impressive. I left the felt box out in case any of the children wanted to have a go and eventually they decided that they had to try just as I was heading off to the studio to do some serious work on Sunday. Perfect timing as per normal. However, I couldn't resist delaying and helping them make felt (or was it I was worried about what would happen with wet hands and small children and my precious box of wool tops?). Here are my two year old's first attempts at felt. She enjoyed making the first piece so much she had another go and then decided that playing with the soap bubbles was more fun. One of her brothers was too busy playing a board game to be interested, but our seven year old thinks he knows it all after a two hour felt making class last summer. This was his piece (on the right). I realised after I invited my friends round to make felt that I hadn't made any for ages and even better couldn't find my felt samples box. So I quickly made two little pieces to demonstrate how to make it. To use the cliche, it was a bit like riding a bike - my hands seemed to know what to do without me having to think about it. As I am so bad at tidying up the felt box is still out and I hope to make some more soon. It was so much fun and no pressure to make something fabulous, although I am thinking about how I could use it next, once I've added some stitch. The start of the next 37? Having finished the work for my exhibition, I wanted to make some small (12in) pieces for a couple of charity things I feel I should contribute to. 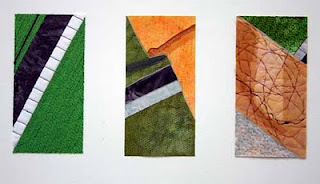 Although small, this is double the size of the 6 x 12in series I have just completed. With my mind still on the 37 steps imagery, it seemed a like a good opportunity to use them further and to see if they would scale up. I think I said I didn't want to make them any bigger, but hey, it is my prerogative to change my mind! This first one was okay, but not quite how I wanted it. They grey background wipes out a lot of the colours of the thread. 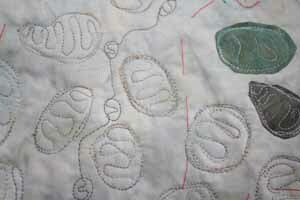 The second one I tried looping the thread rather than stitching between the ‘blobs’. I like the idea of this, but can’t decide whether viewers would think it made the piece more 3-D or just plain messy. I’m sure there would be a mixture of both. The top black bit definitely does not work due to lack of shape. It looks like it landed there! For version four, which is where I am now, I added black lines rather than grey. I think these are probably a bit too strong. So the question is: which ones should I be happy with or is it back to the sewing machine to make version five. I know what I want to experiment with next. How many samples are required before I get it right or admit defeat or just accept that they are acceptable? I think I am unsure which implies I'm not there yet. Also how do I scale this even larger – to try a 37in version of one of my 37 steps? 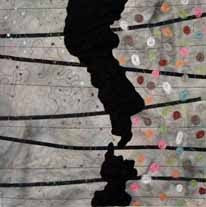 I'm really excited because my exhibition is featured on the textile blog this weekend. 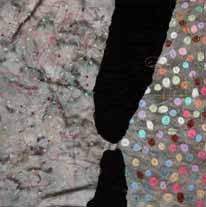 The blog covers a mixture of historical textiles and contemporary textile/fiber artists, so I feel really honoured to be included. John says some interesting things about the use of patterning in textiles in his post. Check it out. I ran a workshop on Saturday afternoon in conjunction with the exhibition. One of the participants had booked before it was open to the public because she had read about it here. Hello, Susan if you are reading today. Hope you enjoyed the workshop. We drew bits from photos and then used scraps of fabric to create the ideas into an artwork. It was fascinating seeing what other people took from my photos and they highlighted things I hadn't really noticed - even though I've been staring at them for a year! It went far too quick and everyone seemed to enjoy themselves, including me (!) which was great. I had hoped to have some more images from the exhibition to show you, but I ran out of time to photograph the second room properly on Saturday. To give you a flavour, here are some shots of some of the 37 pieces on the wall in groups. Having showed them on my blog as landscape pieces and having thought of them like that myself, they actually worked a lot better vertically!